RTÉ Entertainment's John Byrne talks to director David Caffrey about his latest series, Taken Down, which promises to be just as controversial and captivating as his last show, Love/Hate. Poolbeg is a weird place. Situated at the end of a peninsula to the east of Irishtown and Sandymount, it's famous for the twin thermal station chimneys at Poolbeg Generating Station, which are among the tallest structures in Ireland and are visible from most of Dublin city. Other than that, though, it pretty much resembles a set from The Walking Dead. It's got a post-apocalyptic feel to it, and it's like you're not in Dublin at all. It's an ideally striking location for a film or TV show. I'm at a disused warehouse, which has been brought back to life as a Garda station for RTÉ One's new drama, Taken Down. 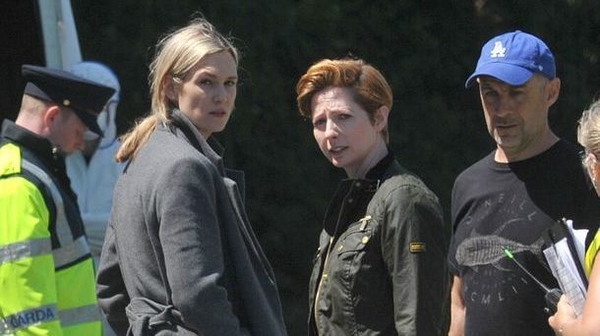 Judging by the names involved in the production, this is going to be one of, if not the TV event of the year! The creative team behind Love/Hate, Stuart Carolan (writer/executive producer), Suzanne McAuley (executive producer) and David Caffrey (director) are back together, and are joined by best-selling novelist Jo Spain for this brand new crime series. That's one serious line-up! 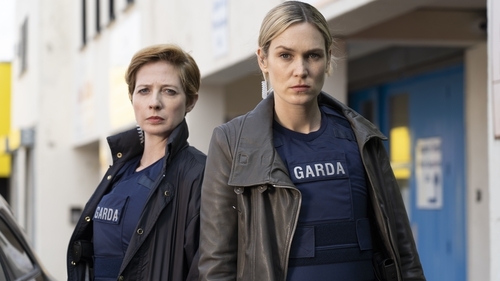 The show focuses on Detective Jen Rooney (Lynn Rafferty) as she investigates the violent death of a Nigerian girl whose body is found close to a Direct Provision Centre, where refugees wait for political asylum. Her investigation brings viewers into a twilight world of the new Ireland where slum landlords and criminals prey on the vulnerable. The talented cast includes Aïssa Maïga (Anything for Alice, Bianco e Nero), Brian Gleeson (Resistance, Phantom Thread), Lynn Rafferty (Love/Hate), Orla Fitzgerald (The Young Offenders) Jimmy Smallhorne (Love/Hate, Clean Break), Barry Ward (End of The F*cking World, The Fall), Enoch Frost (Skyfall, The Desert) and Slimane Dazi (A Prophet, Rengaine). Director David Caffrey is up to his eyeballs with the production, but sticks his head into the mock Garda Station for some light interrogation about his latest project . . .
John Byrne: So what scenes are you shooting today? David Caffrey: Today is a flashback of a character who would've come to Ireland and been in the Direct Provision system. He's come from a very difficult situation, and he's befriended one of our main character's children. So he's older, wiser - he's come from a pretty severe background and escaped some heavy-duty stuff in Algeria, and now he's in Direct Provision in Ireland. He's a man who imparts lots of wisdom to Isaiah and keeps him straight. He's a sort of a father figure to him in an unconventional kind of way. Is the setting of Dublin an important element of Taken Down? Very much so. We're all familiar with Direct Provision centres around the country, but with the nature of what we're doing it's firmly set in Dublin, and we're just very fortunate with the locations. I started with an image in my mind of seeing - and I thought I was going to have to do it with computer- generated images - I wanted a very industrial place, where this Direct Provision centre is. There was a place up on the Long Mile Road I used to see when we were filming Love/Hate . . . and I wanted that very much as a backdrop. So then we figured out that the CGI was going to be too expensive, and then somebody suggested this Blade Runner-style gas tower site down at Poolbeg. We came down and had a look here and we found it fitted two bills. Have you been in a Direct Provision centre to see what goes on? I have been in to see a few places and I've spoken to people. Were you surprised by what you saw at the centres? No, it was kind of what I expected. I'd done a lot of research beforehand anyway, and I'd spoken to people who'd come out the other side of it. Circumstance has a lot to do with the situation [these people are in]. And just delving into the grey area of the whole thing, there's no particularly good or bad character in this. There are some pretty bad characters, but it's from the walk of life. They're coming from everywhere. So, in terms of people who are displaced, and people who do have to come and live in different places, it's not the minute you land in what would be considered First World Utopia, [but] it certainly turns to Dystopia in a very quick fashion, because there are people who will just manipulate you. So how do you follow Love/Hate? This sounds completely different. How did it come about? The subject matter's something I found very interesting. It was Jo Spain's original idea, that's where the germ started. I think Jo and Stuart then became involved, Suzanne became involved, and then subsequently I became involved in a situation where you work with a team you've worked with quite closely before. There's a certain leap of faith you take on, but I just found that the connection with Suzanne and Stuart before was such a strong one. I thought Jo had very strong ideas, and she's great too. There was a certain leap of faith because we weren't completely formulated, exactly what we wanted the series to be. When I arrived on the scene it became a little bit more crystalised. What do you hope that audiences will get out of Taken Down? There's a few things. With the Love/Hate thing, and with this show, from my place as a filmmaker it's a privilege in a way to be a party, to witness and speak to people, and learn at first hand the actual situations that these people find themselves in. First off, my job is to make interesting drama, so lots of people watch it. The next thing is, for me, the sort of ancillary benefits of it is if we look at the people who go through Direct Provision and actually see everybody's human beings - we're not statistics. Some of the people have now got their Irish papers and they're in the series, and some of them have been through Direct Provision. Some are actors - the most talented actors from around the world - depicting these people. But it's humanising things that somewhat gets stuffed away. I feel it's a privilege to be involved in something that does highlight that.